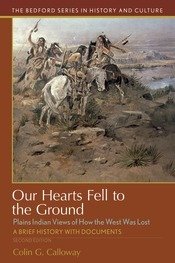 This revised edition of Colin Calloway’s Our Hearts Fell to the Ground continues to offer a look into the Native American views of the changing West in the nineteenth century through a selection of primary accounts, speeches, and writings. With a revised introduction and a number of new documents, this second edition now includes new coverage of the Northern Cheyennes’ bid for freedom in 1878; a testimony by a Ponca chief who won a landmark court case; an Indian teacher’s thoughts on Indian schools; and an old woman’s memory of her experience as a teenage girl at the Wounded Knee massacre. The epilogue has been expanded and the bibliography updated to include many of the excellent and path-breaking works that have appeared in the twenty years since the first edition was published. Updated chronology and questions further serve to aid students as they make their way through this rich collection of documents.